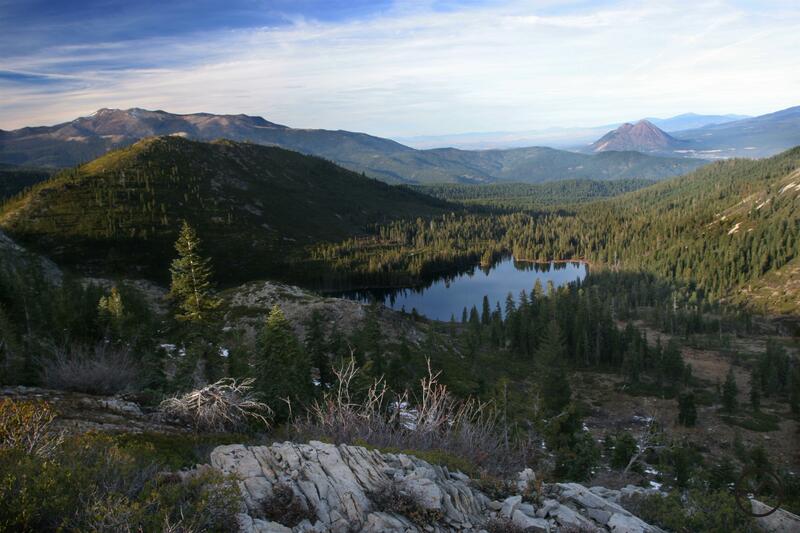 Climbing high above Castle Lake to diminutive Heart Lake, the trail provides astounding views of Mount Shasta, as well as providing a chance to ascend Castle Peak, offering another vista of Mount Shasta as well as a stunning view of the Castle Crags. Mount Shasta reflects in Heart Lake. Although short, the Trinity Divide’s Heart Lake Trail is a titan when in terms of scenery and vistas. Few trails offer as much alpine terrain and tremendous vistas for such little effort. Beginning at the Castle Lake trailhead, a worthy destination in its own right, the trail climbs to a craggy bench high atop massive Castle Lake. 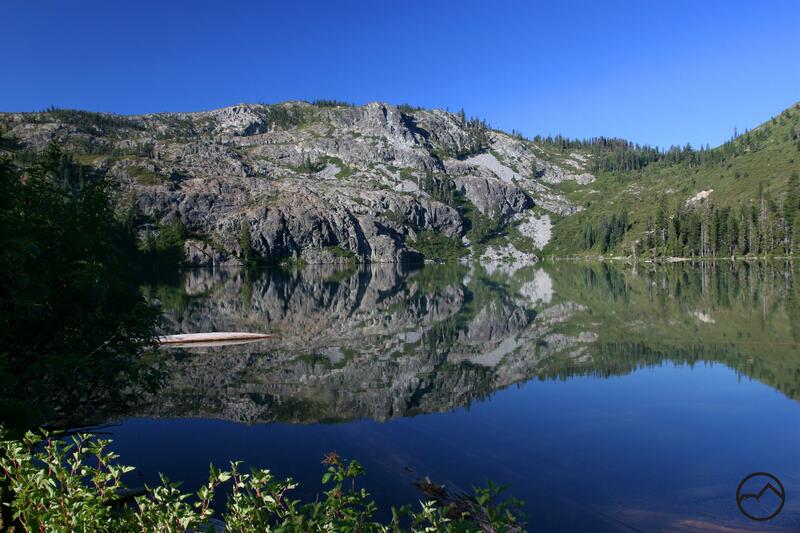 There, nestled into the rocky cliffs hundreds of feet above Castle Lake is small Heart Lake. Though diminutive in size, the lake offers one of the finest views of mighty Mount Shasta. The great volcano rises above the stony dike at the north end of the lake, looming majestically in the distance. It is a memorable vista, a point of profound beauty, yet it is only half of the wonders the small trail offers. A semi-loop can be made, departing the Heart Lake Trail and climbing to the top of Castle Peak, whose summit is just above Heart Lake. 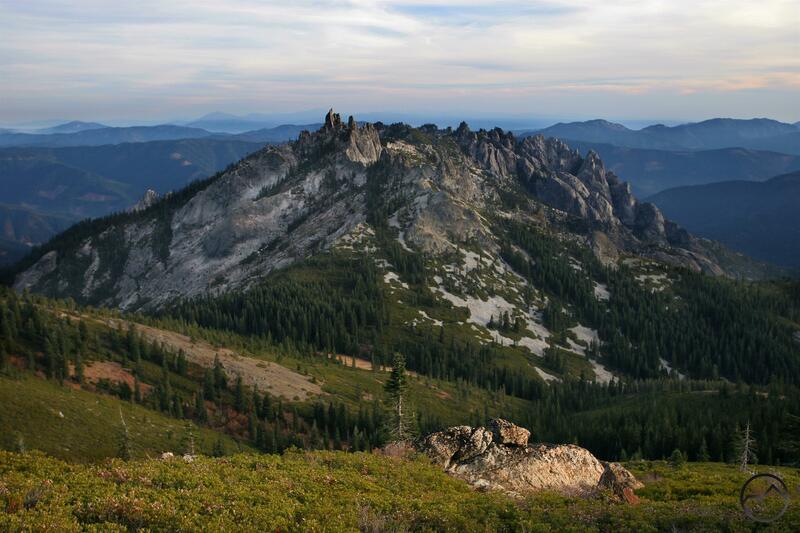 From the summit, more fantastic views await, including the labyrinthine Castle Crags and distant Lassen Peak. It is surprising that such mesmerizing views are obtained from such a short trail but the Heart Lake Trail is barely 3 miles long. 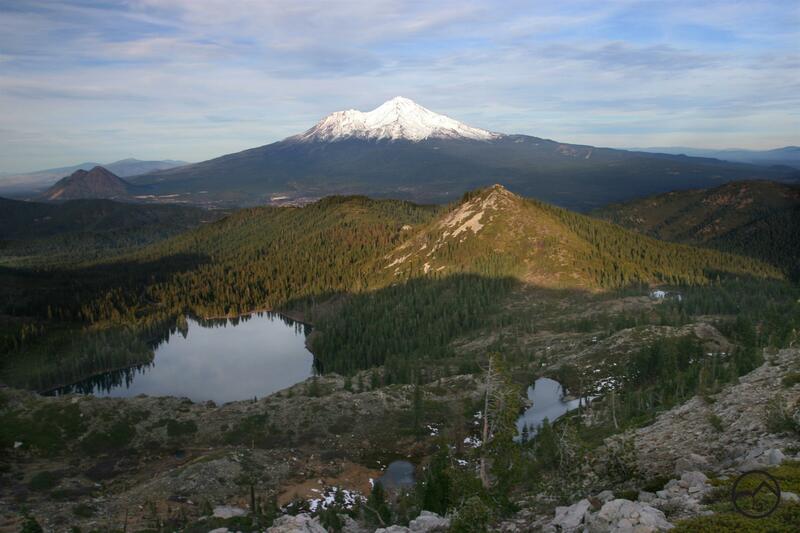 It is possibly the finest 3 miles of trail in the Mount Shasta area. The road to Castle Lake is plowed in winter. Consequently, this is a fantastic trail to snowshoe during the winter. Castle Lake viewed from the trailhead. 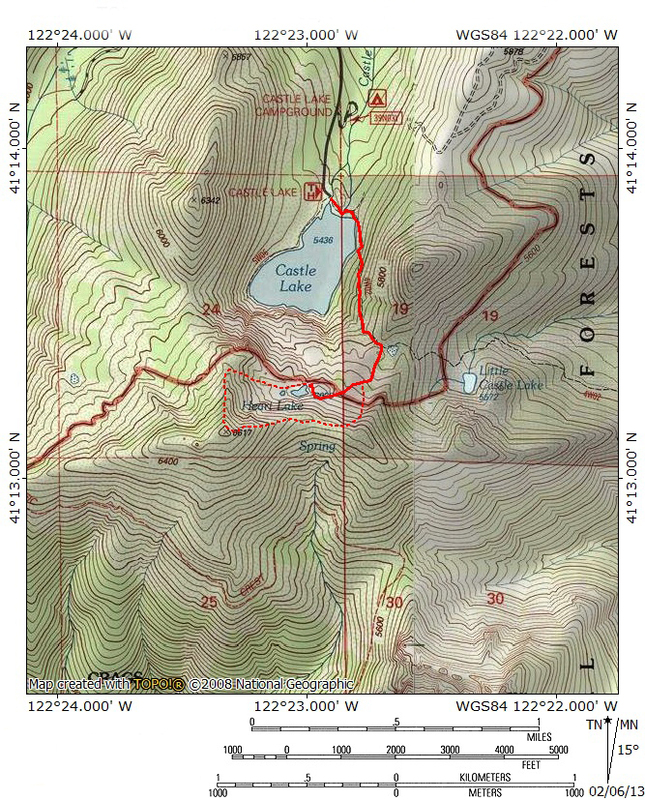 The Heart Lake Trail begins at the Castle Lake trailhead and follows the Castle Lake Trail for the first 0.6 miles before the Heart Lake Trail departs from the Castle Lake Trail. To begin from the parking lot, follow the path east, crossing the lakes outlet after only 30 yards or so. Once across the creek, which is Castle Lake Creek, the trail turns south and begins climbing up the eastern wall above Castle Lake. As the route gains elevation, views of Castle Lake periodically open up through the trees. The lake is one of the three largest in the Klamath Mountains, along with Caribou Lake in the Trinity Alps, which at 72 acres is the largest, and Ukonom Lake in the Marble Mountains. The summit of Castle Peak is visible above the sheer granite headwall at the southern end of the lake. As one nears the top of the climb, the trees thin out and the trail becomes rockier. At 0.5 miles from the trailhead, one finally reaches a saddle 400 feet above Castle Lake. Distant Porcupine Peak seen from the Heart Lake Trail. At the saddle, the Castle Lake Trail continues to the east, dropping down to Little Castle Lake and then proceeding on to Mount Bradley Ridge. To reach Heart Lake, stay to the right at the top of the saddle. There are a few different use trails established here which might create a bit of confusion. Simply follow any one of them to the right, heading toward the high ridge. Eventually all the paths converge and level out. The trail heads toward the west, passing through a small meadow-like area. The grass is a bit too sparse and the area too unwatered to be considered a true meadow. The trail heads toward a notch between the cliffs of Castle Peak and a small rocky knoll. On the far side of this notch, the trail descends slightly to Heart Lake. Heart Lake is small. It is not even a tenth of the size of Castle Lake. Nonetheless, it packs an extremely scenic punch, far outclassing many lakes that are much larger in size. From the south side of the lake, one has one of the finest views of Mount Shasta to be had anywhere. 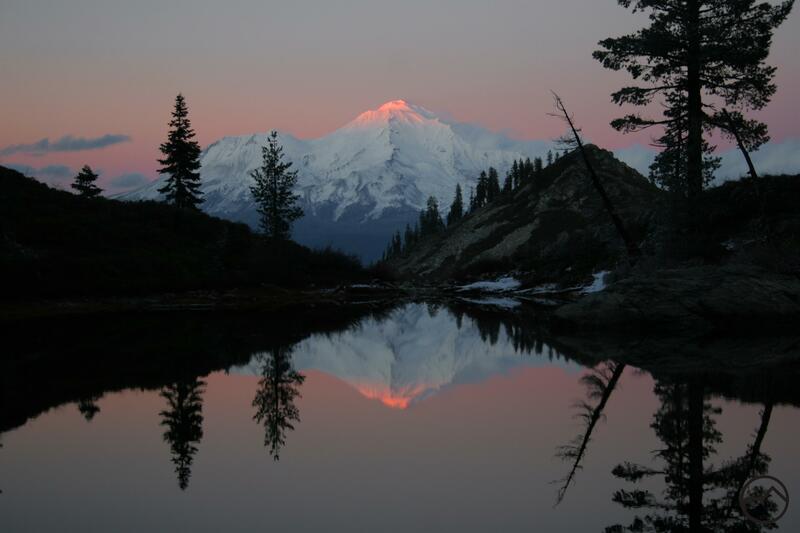 Depending on the time of day, one can be graced with a gorgeous reflection of California’s most spectacular mountain. During the summer, the lake warms up earlier than many of the other lakes in the area, making for a great place to take a swim in the afternoon. Castle Lake itself is not visible from this spot. To see the lake, climb the little rocky knoll just to the right of Heart Lake’s outlet. From there Castle Lake can be observed far below. However, this view, which excludes Heart Lake, is inferior to the one from the summit of Castle Peak, which is directly overhead. The ascent of Castle Peak forms a loop with the trail to Heart Lake. It can be climbed before or after heading to Heart Lake. If one wishes to climb the peak from Heart Lake, cross the outlet and follow the trail to the west. The trail passes another small tarn bordered by an attractive meadow. This spot makes a great campsite if one wants to backpack up to Heart Lake, which has no good campsites on the lake itself. The trail proceeds for almost 0.3 miles from Heart Lake, beginning to climb as it passes the small tarn. Soon it reaches a ridge and the trail grows faint and makes a sharp turn to the south. This ridge is steep and the route is faint but not difficult to discern. The ridge climbs almost 400 feet in 0.2 miles to the summit of Castle Peak. The peak gets its name from its position between Castle Lake and the Castle Crags. The eastern flank of the mountain was the site of the Battle of the Castle Crags, which was a pitched fight between prospectors and Native Americans in 1855. This was the last confirmed battle in which the Indians fought solely with traditional weapons. Castle Crags from Castle Peak. Once on the summit of Castle Peak, a tremendous, expansive scene opens up. Mount Shasta presides magisterially over the Strawberry Valley and all of its denizens, including Black Butte and Spring Hill. Mount Eddy rises on the west side of the valley, an impressive mountain in its own right. 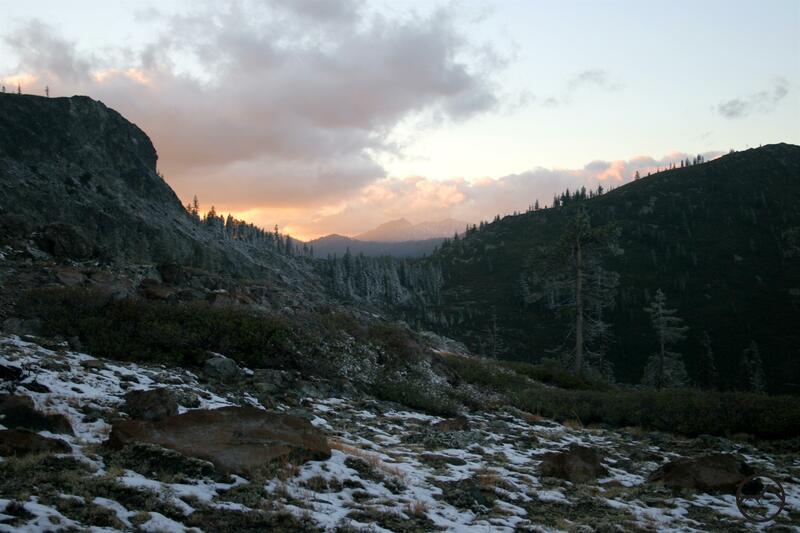 Between these two giants, the northernmost peaks of the California Cascades, including the Goosenest and Willow Creek Mountain can be seen. 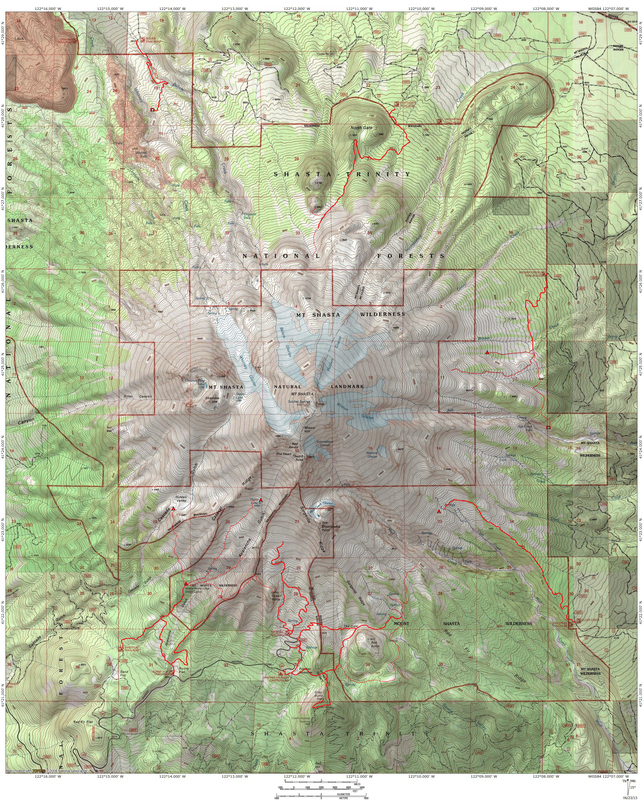 Beyond them, in Oregon are Mount McLoughlin and Pilot Rock. South of Castle Peak rise the immense bulk of the Castle Crags, with the countless granite spires spiking skyward. Far beyond this awesome rocky vision, Lassen Peak and the cadre of smaller peaks that make up the ruins of Mount Tehama, as well as Crater Peak and Burney Mountain all line the horizon. When one is ready to depart this stunning panorama, follow the narrow but obvious path that leads east, down the opposite side of Castle Peak from the one ascended. The path stays right at the crest of the ridge and the drop-off on the north side is very sheer. After 0.5 miles, the cliffs soften and become a much more moderate slope. Simply head down this slope and across the level bench at the bottom until one intersects the Heart Lake Trail. Follow it to the intersection with the Cliff Lake Trail and then descend to the trailhead. Looking north from the ascent up Castle Peak. Great morning hike,easy directions. View was terrific. Thanks for this site, we use this every week to plan our hike. Is heart lake dried out now? We just went and saw what we thought was a remnant of it according to your photos would love to know for sure! Thanks! We’re going beginning of Nov – will I have to have snowshoes or waterproof boots to do this hike? Hey there! I’m planning on going in a few days. How were the snow levels when you were there? I didn’t go because I couldn’t get any info about it, and I live in FL, so don’t have the proper clothing. :/ I sincerely hope to know what you think/experience if you go! I didn’t go because I couldn’t get any info about it, and I live in FL, so don’t have the proper clothing. I sincerely hope to know what you think/experience if you go! I want to do this hike! I wonder if it would be dangerous this time of the year? Considering the temperatures, wind, and fire danger? Fire danger? Hardly! You may still run into snow up there. Do it in the late afternoon/evening. It will be cooler and the light on Mount Shasta at that time will be awesome. I really want to do this hike on my way through the area but the USDA website says it’s private property and there is no legal access to heart lake?? Did you end up doing this hike? We’re planning on doing it this upcoming weekend but I want to make sure 1. It’s not dried up and 2. It’s not on private property? The lake has not dried up. It is not on private property but part of the trail to it is. It is open, just hike at your own risk. We visited Castle Lake & hiked up to Heart Lake on Aug 28 2017, and it was a beautiful, sunny day. The hike itself wasn’t terribly difficult and the trail was fairly easy to follow. Heart Lake was just as beautiful – if not more – as the pictures I’d seen. Definitely worth the trip!